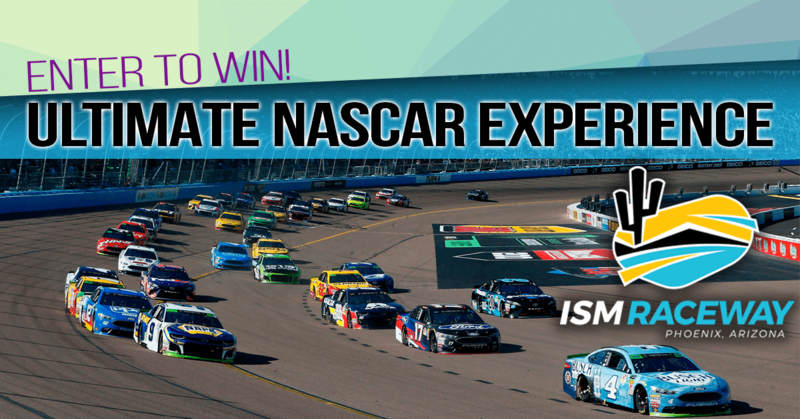 ENTER TO WIN ISM RACEWAY NASCAR TICKETS! From February 20th, 2019 - March 6th, 2019​ enter daily for your chance to win a pair of tickets to the TicketGuardian 500 NASCAR at ISM Raceway for Sunday March, 10th, 2019! 2 Tickets to the 2019 TicketGuardian 500 NASCAR at ISM Raceway for Sunday March, 10th, 2019. 2 Tickets to the INfield - giving you access to the teams and drivers like never before! Go to aztv.com and fill out the daily contest entry form. Enter each day during the Sweepstakes window (February 20th, 2019 - March 6th, 2019) to increase your chances to win. Starting February 20th, 2019 at 8a, contestants enter online until March 6th, 2019 at 11:59p at aztv.com/win for your chance to win. One entry per person, per day during contest entry period. Contest signups will end at 11:59 a.m. the following day. Winner is responsible for ensuring accurate contact information and will be notified via email. Winner has 24 hours to claim their prize and must present photo identification. Prize MUST be picked up by 2p Friday, March 8th, 2019 or winner will forfeit prize. All entrants must be age 18 or older. Prize is not transferable to another person and may not be combined with any other offer. Prize components cannot be substituted, except as specified in the Official Rules. If Prize recipient fails to arrive on the scheduled arrival date (no-show arrival) or shortens stay for any reason, Prize will be deemed awarded. Grand Prize Winner and guest are responsible for their own travel/parking arrangements to and from ISM Raceway. AZTV is not responsible for any delays, cancellations, or force majeure events (as understood in the travel industry) that delay or result in cancellation of the NASCAR events March 9th– 11th, 2019. By participating in this Contest all persons who enter or seek to enter, whether or not they become Winners, agree to be bound by these rules and the decisions of the judges and forever release and agree to indemnify and hold harmless AZTV, its sponsors, members, subsidiaries, parent companies and the officers, employees and directors of each of them from and for any claim, liability, expense, cost, income tax, loss or damage caused by or arising out of participation in this Contest and/or the receipt and/or use of any Prize. Odds of winning will vary depending on the number of Entrants.